The pre-Hispanic goldwork of Colombia is traditionally classified by archaeological zones, or regions, each with stylistic associations, varying in iconography and technology: Calima, Quimbaya, Tolima, and Nariño in the southwest; Zenú (Sinú) and Tairona in northwestern Colombia; and Muisca in the central highlands southeast of Bogotá. The Calima region encompasses the upper Calima River valley and surrounding areas of the Western Cordillera, extending east to the Cauca River. Calima goldwork, like other styles of southwestern Colombia, is characterized by the use of high-quality gold and a preference for working the metal directly by hammering. Research in the Calima region has established several periods of occupation. Calima goldsmiths achieved their foremost accomplishments during the period called Yotoco (100-700 CE). Their richly varied works were primarily objects of personal adornment. 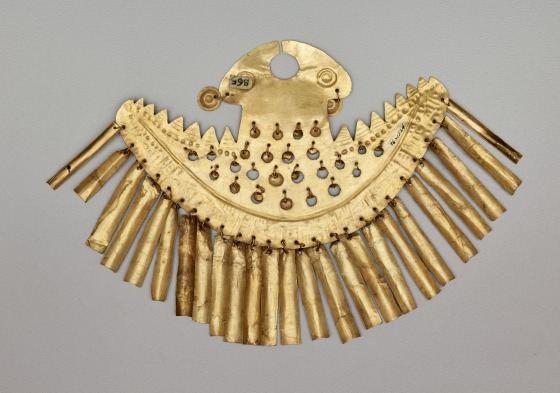 Headdress elements, pectorals, bracelets, anklets, and nose and ear ornaments probably functioned as ceremonial regalia for elite men. 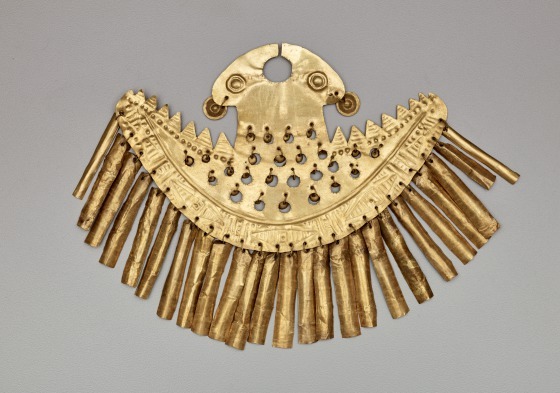 Typical Yotoco gold pieces include an elaborate headdress ornament (1976.W.319), a large chest pectoral (1976.W.318), dish‑shaped ear ornaments (1976.W.329.A-B) which could have been attached to a cloth headdress, and an H‑shaped nose ornament (itself a face) such as this example. Decorated with simple raised dots and a linear band around the edge, this highly polished ornament features large circular bosses and small gold elements that cover nearly the entire surface. The dangling pendant elements of the headdress and nose ornament would have responded to the wearer’s movements, reflecting light and producing gentle metallic sounds. When worn together with the pectoral, as many pieces undoubtedly were, they would have created a dazzling golden image.